Arab residents of capital allegedly targeted Jews walking alone, forcing them to the ground and beating them before robbing them. 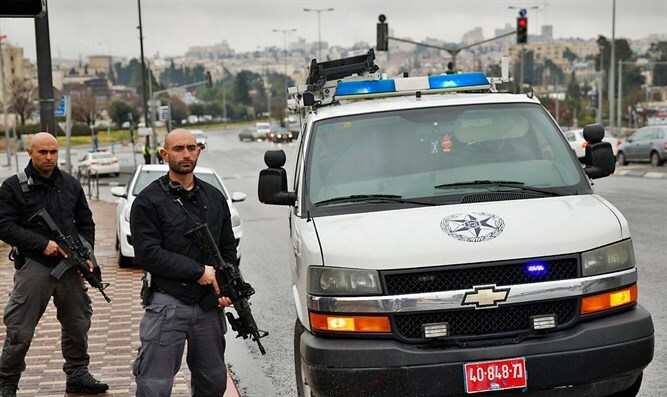 Jerusalem district police arrested two Arab men from eastern Jerusalem, following a string of violent attacks and robberies last week targeting Jews in the seam-line area near the Old City. Police say the two men are suspected in at least five attacks last week. The suspects are slated to be brought before a Jerusalem court on Tuesday for extensions of their arrests. The two were taken into custody after police received a number of complaints of violent robberies in recent days. Jerusalem police formed a special team to investigate the crimes and explore possible links between them. The investigation revealed that the two repeated the same pattern in multiple attacks, singling out individuals walking alone, shoving them to the ground, beating them, then stealing their bag, wallet, cellular device, or other valuables, before fleeing the scene. In at least one case, the suspects make purchases with one of their victim’s credit cards. After evidence was gathered and the suspects identified the two were taken into custody. During questioning the suspects tied themselves to the crimes, and during a search of one suspect’s residence, equipment purchased with a victim’s credit card was found. “The personal safety of residents and visitors is our top priority,” a Jerusalem district police spokesperson said.